Help prevent your RV roof from fading, oxidizing, drying and cracking from harsh UV rays, water or grime. 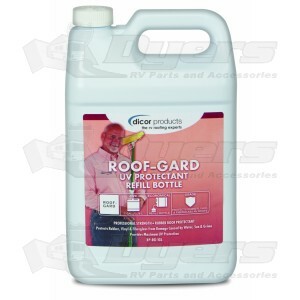 Roof-Gard Rubber Roof Protectant is ideal for all RV roofs – including rubber, vinyl and fiberglass. Its mild, non-abrasive formula keeps surfaces cleaner longer with no residue or oily build-up. - Roof-Gard is perfect for protecting exposed surfaces on RVs, boats and personal watercraft. It’s also ideal for sporting/leisure items such as life jackets, wet/dry suits, sailcloth, vinyl spa covers as well as plastic patio and resin furniture. You can apply Roof-Gard to countertops, tables, painted wood, fiberglass showers, trim (plastic, vinyl and leather), wheels, bumpers, fiberglass or gelcoat surfaces, running boards and valve covers. Some products sold for RV maintenance contain petroleum distillates and citric ingredients. These chemicals will damage your roof membrane and shorten its life. Whether you choose Dicor’s Roof-Gard Rubber Roof Protectant or another brand, be sure the products you use do not contain these harmful chemicals. Clean roof first with Dicor Rubber Roof Cleaner. Spray directly on to clean surface, out of direct sunlght in 3' X 3' sections. One quart treats up to a 40' RV. To provide for even coverage, wipe with soft cloth or sponge mop. For MAXIMUM UV PROTECTION reapply every 3-5 weeks or after every cleaning. Caution: Do not use on shower floor or any surface where a slippery or slick surface is undesireable. First Aid: Harmful if swallowed. If ingested, drink water or milk. If contact with eyes, wash with water for at least 15 minutes. Call a physician immediately.